The Massachusetts General Hospital acute stroke imaging algorithm: an experience and evidence based approach. 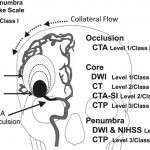 The Massachusetts General Hospital Neuroradiology Division employed an experience and evidence based approach to develop a neuroimaging algorithm to best select patients with severe ischemic strokes caused by anterior circulation occlusions (ACOs) for intravenous tissue plasminogen activator and endovascular treatment. Methods found to be of value included the National Institutes of Health Stroke Scale (NIHSS), non-contrast CT, CT angiography (CTA) and diffusion MRI. Perfusion imaging by CT and MRI were found to be unnecessary for safe and effective triage of patients with severe ACOs. 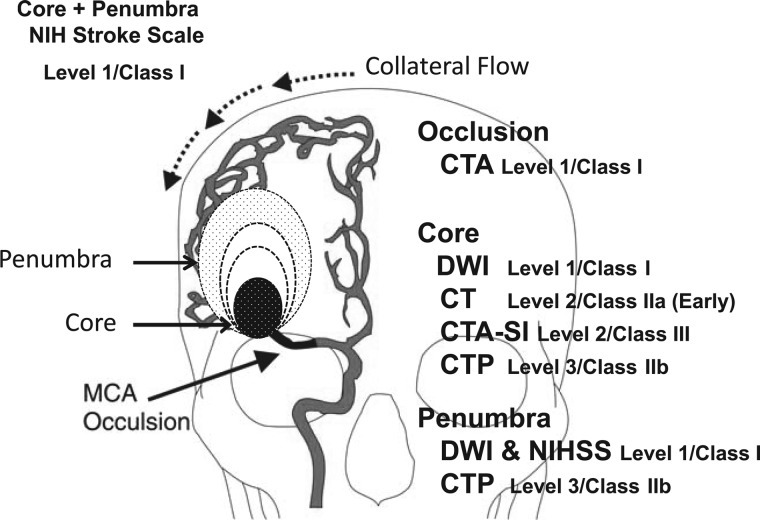 An algorithm was adopted that includes: non-contrast CT to identify hemorrhage and large hypodensity followed by CTA to identify the ACO; diffusion MRI to estimate the core infarct; and NIHSS in conjunction with diffusion data to estimate the clinical penumbra.